A steady light noise is simply part of Triberg. 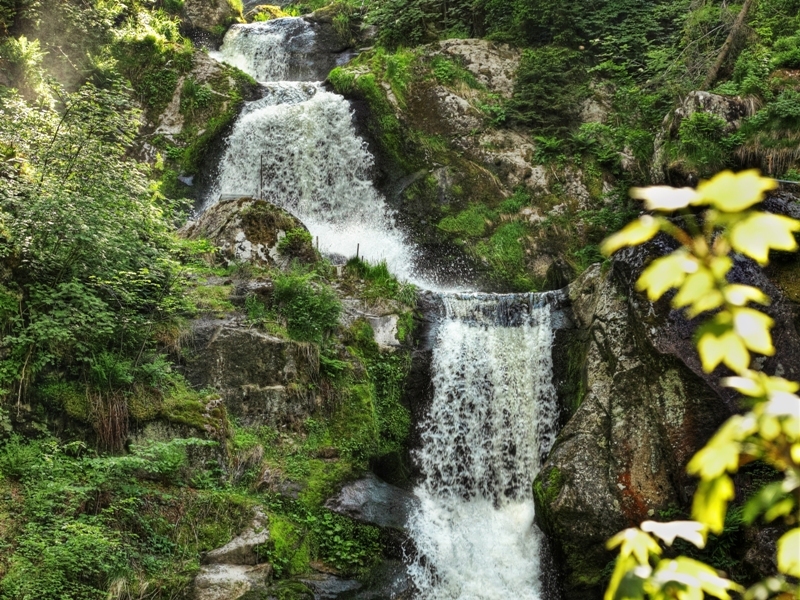 After all, it’s here, where Germany's highest waterfalls come down the mountains on the outskirts of Triberg. Foaming and roaring the water plunges 163 meters down the river called “Gutach”. On the paths along the seven stages, you will find a magnificent spectacle of nature. Find out more on descriptive panels about animals, plants and special features on the waterfall area and watch the many squirrels along the way. Germany's highest waterfalls offer many surprises! Especially in times of snowmelt and after heavy rains, the water comes down dramatically. A little tip: Take any of the three marked trails and enjoy the spectacle on the “Naturweg”, the “Kulturweg”, or “Kaskadenweg”. The main entrance to the waterfalls can be quickly and easily reached from the city center by foot. But also four further entrances offer you the opportunity to reach the waterfalls from all sides. Approach by car? You will find parking places in the city center, at the "Bergsee", at the “Scheffelplatz” or at the “Adelheid”. The falls are illuminated during the night until about 22:00h and offer a fascinating sight. The Map to "Germany's highest Waterfalls".pdf (2,3 MB) with an overview map you can download here in PDF format. Did you know that the falls by ionization of the air are healthful against bronchial asthma or when you catch a cold? 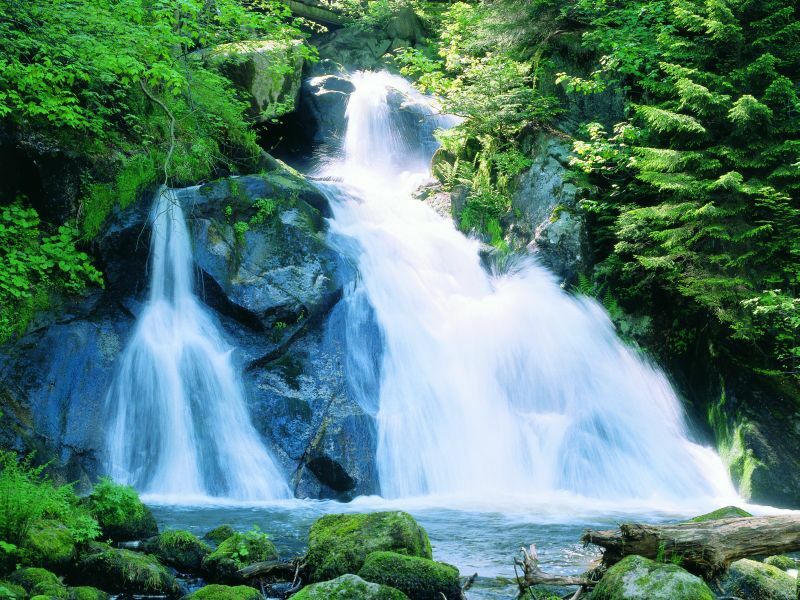 The waterfalls are included int the all-inclusive project SchwarzwaldCard ! For more information on the Black Forest Card, visit Homepage SchwarzwaldCard. Accessible for wheelchair users on access Asklepios Clinic (Ludwigstr. 1, 78098 Triberg). Flat trail to the first platform. 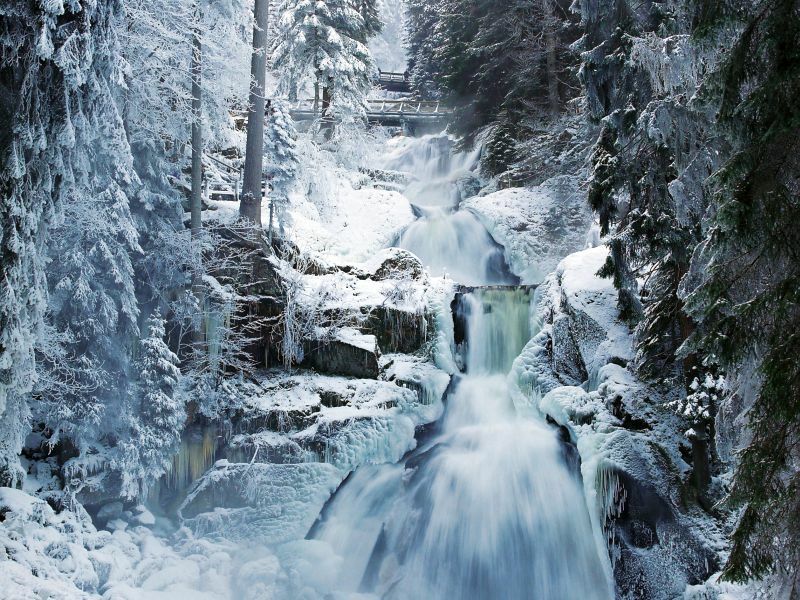 Germany's highest waterfalls in the winter is an experience. The waterfalls can be visited daily in the winter and provide for all weather, sun, rain, snow or ice, an impressive backdrop. In addition, the falls are open daily from dusk lit. 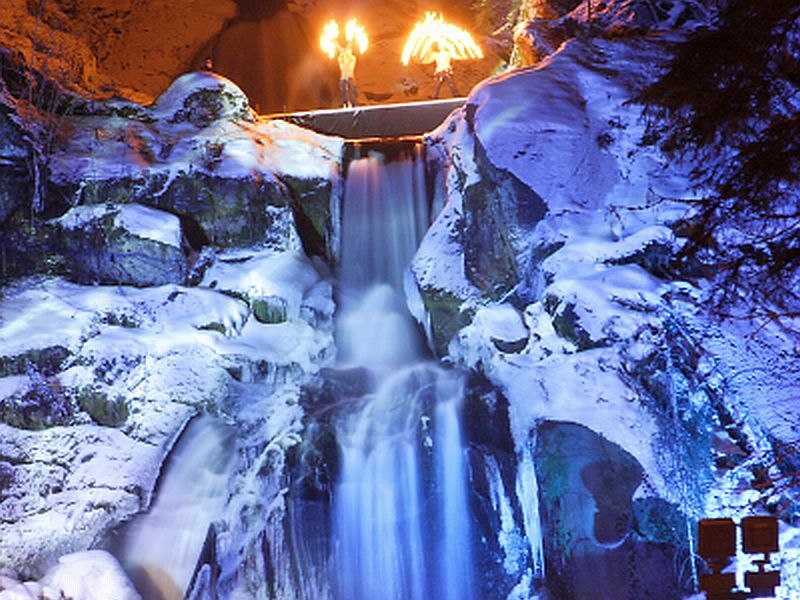 In the period from 25. to 30. of december are the waterfalls only to visit as part of the special event "Triberger Weihnachtszauber". There are special admission prices. More information can be found on the Website Triberger Weihnachtszauber. 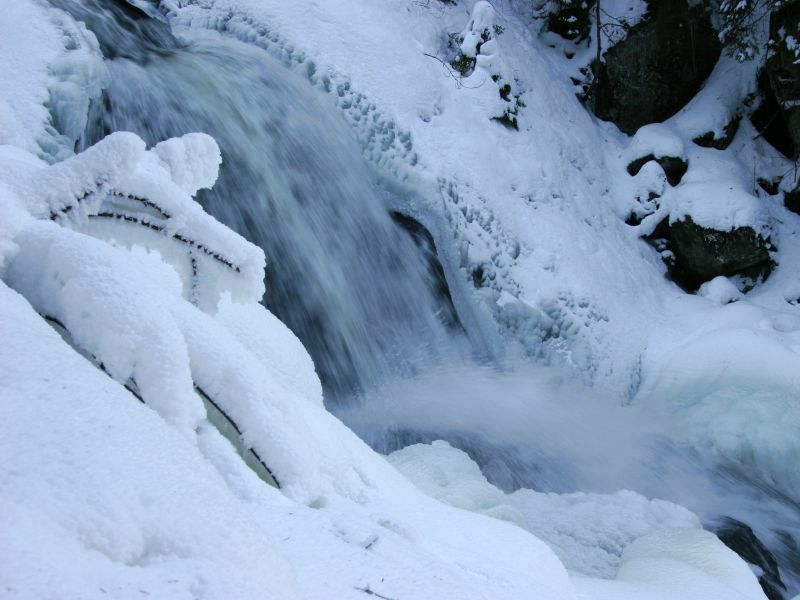 As part of the winter opening you only can visit the lower part of the falls. It is accessible if you pass by the main cash. In this part the snow will also be cleared away and the paths will be scattered. -> For every 20 people 1 person free! 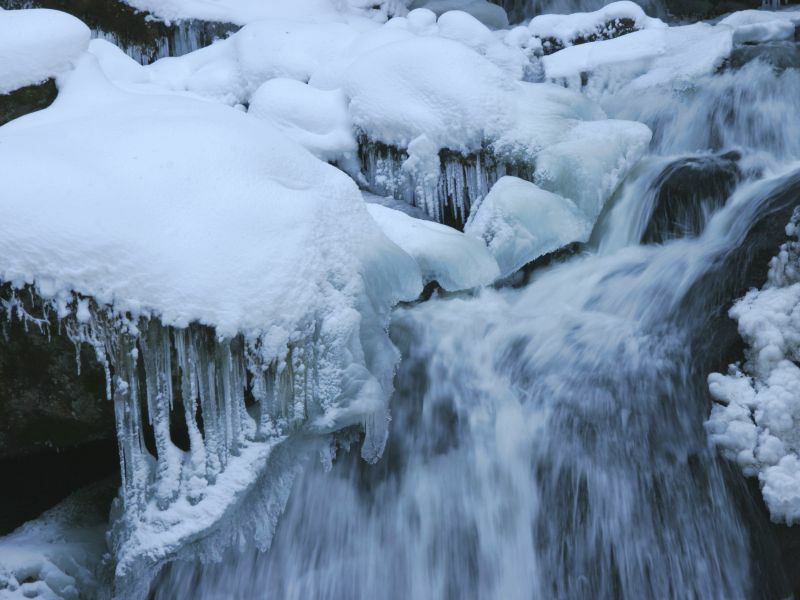 - Companion of severely disabled with proof from 50% and marked "B"
The waterfalls are very beauty in winter, but be careful: The paths may be icy and this can be of danger to you! Outside normal working hours, a tour is on your own risk! Even in summer stay on the marked ways. In case of bad weather, such as for example storm, snow or sleet, it may temporarily come to a closure of the waterfall area. We ask for your understanding. The Tourist Information Triberg pleased to inform you about the current state of the roads in the waterfall area. Call +49 (0) 7722 8664-90. *Combi-Card waterfall/museum = entry to the waterfalls and BlackForest Museum. It is available only during the summer season (Easter to early November, depending on the weather).